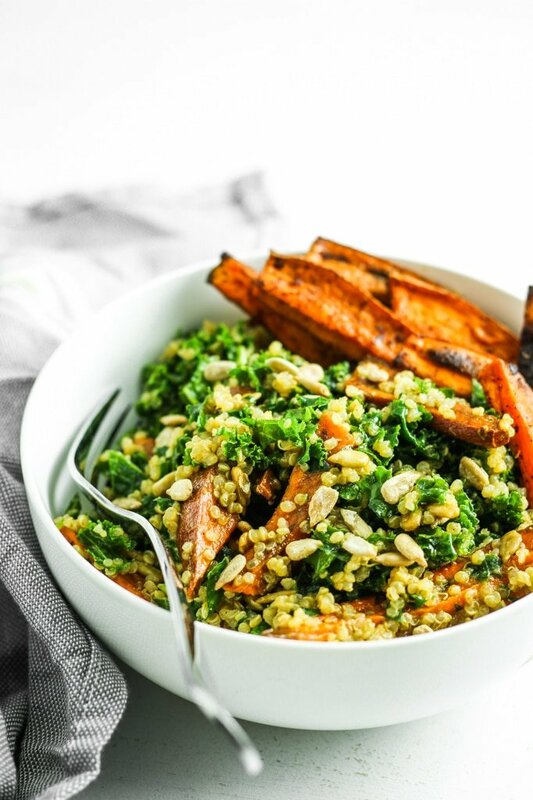 This sweet potato quinoa kale salad recipe is healthy food meets comfort food. 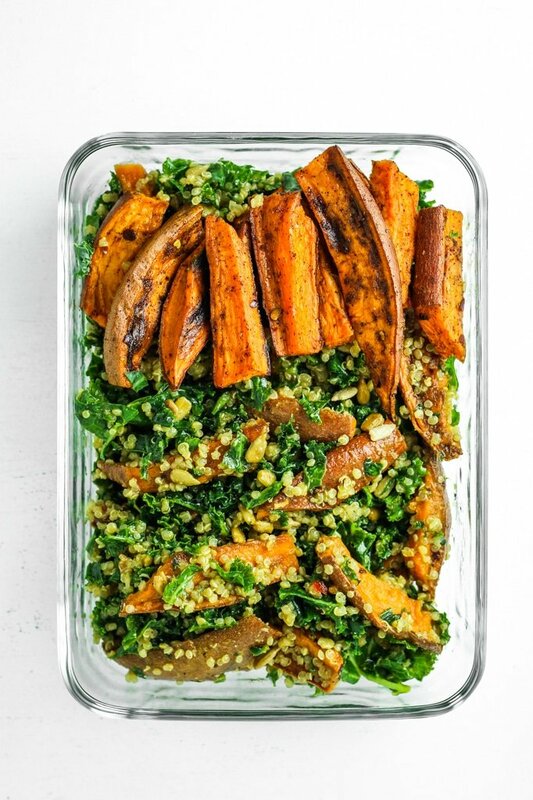 Chopped kale, smokey roasted sweet potatoes, quinoa, sunflower seeds, and a thick miso citrus dressing to wrap it all up. 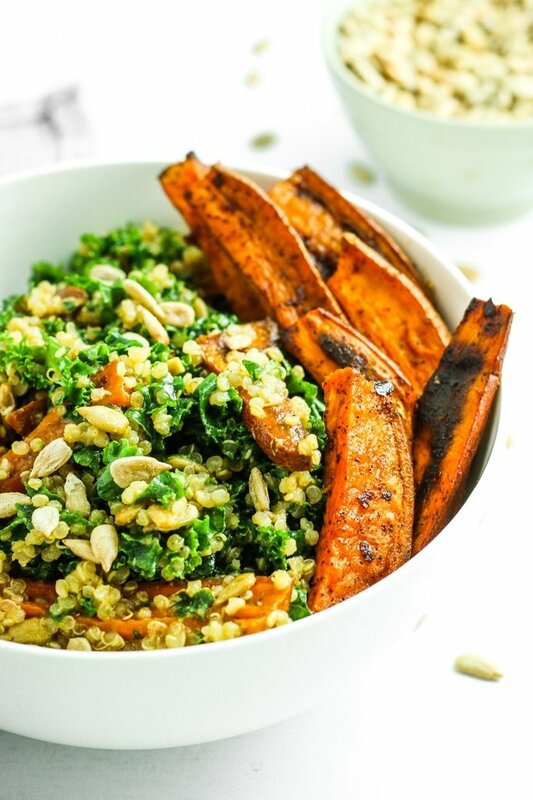 Perfect for lunch, dinner, or meal prep! WOO! Happy Monday, everyone! Did you guys SEE that Justin Timberlake concert last night?! I mean… WHOA.  What a show! Did you love it? Did your team win? I was rooting for the Patriots, but I love a good underdog so I’m not too upset. Let’s kick off (<– see what I did there?) February with a kale salad! Ok. But wait. This kale salad is good. 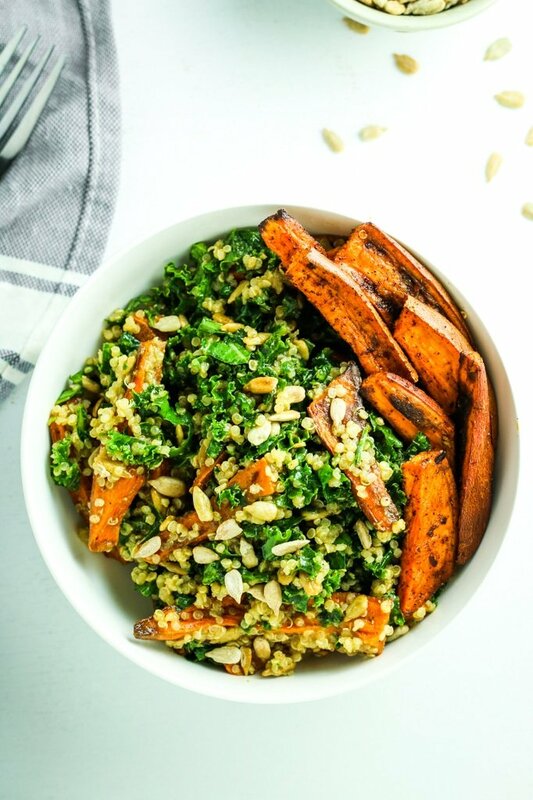 This kale salad has smokey roasted sweet potatoes. And quinoa. And crunchy sunflower seeds. And a ridiculously good citrus dressing. This salad is the kind of thing I’ve been craving lately, so I’m sharing it because I figure plenty of you are probably on the same page. I tend to get in a food rut this time of year. Lately, it’s been potato-kale soup, soft boiled eggs, pizza, and roasted veggies. I made this salad to shake things up and get some variety into my food life. I’m not quite in the mood for smoothies (hello, it was NINETEEN degrees yesterday). Not really in the mood for a regular salad (I miss fresh colorful summer veggies). But I still want to roll with this January clean eating momentum. So we’re gonna compromise. 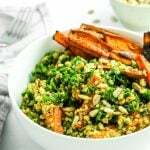 We’re mixing in some grains and winter veggies with the greens to make sure this salad sticks to the ribs and warms us up. Another thing I love about this salad is that it’s versatile. It can be eaten cold or warm and it’s equally delish both ways. I’ve scooped myself a bowl for lunch right out of the fridge and I’ve heated it up on the stovetop and put a yolky egg on top. You can rotate this salad into your meal prep with your other favorite recipes. You can even mix in roasted tofu or chicken for extra protein. Make this salad yours, friend. Make it yours and then tell me all about it! Leave a comment below. Tell me if you liked it (or hated it!). And definitely tag me in a picture of it on Instagram so I can share you on our story! Wash kale thoroughly and dry. De-stem the leaves and chop roughly. I like to chop my kale quite small so it’s easier to chew and digest. Add to a large bowl and set aside. Once sweet potatoes are done cooking, allow them to cool for a few minutes. 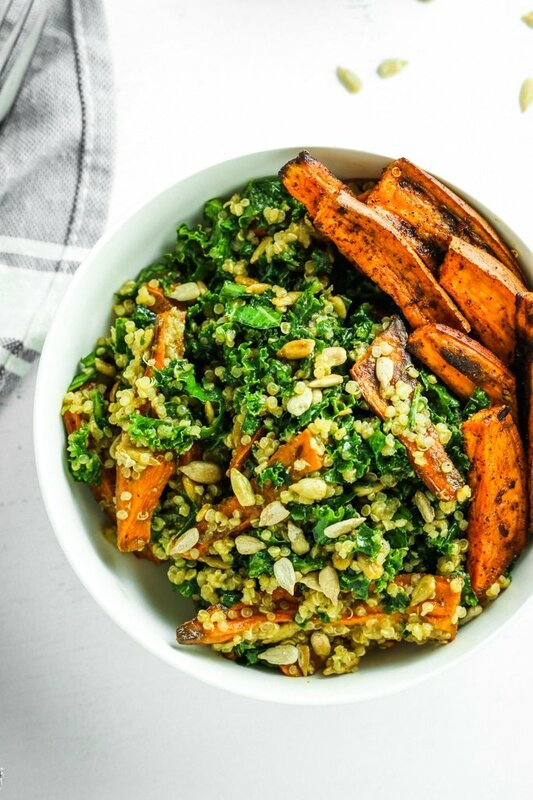 Add quinoa, sweet potatoes, and sunflower seeds to the bowl of kale. Pour in dressing and mix thoroughly to combine. In a 16 oz. mason jar, combine miso, orange juice, syrup, tamari, oil, lemon juice, ginger powder, and red pepper flakes. Shake until well combined. These stay good in the refrigerator for up to 5 days!